Made in a printed jacquard fabric, this Alyce Paris long dress 60269 is absolutely stunning. 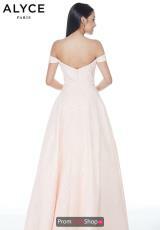 Starting off we have an off the shoulder neckline and small capped sleeves. 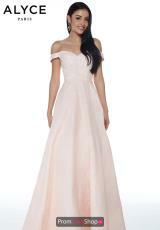 This style is so figure flattering as the bodice is fitted and forms perfectly to ones shape. The a line skirt is full and flowy and will move with your very move. Dont miss your chance to feel like a modern day princess.